At the jail, bribe or persuade the guard to be allowed in. Visit Sibbi in his cell where he explains the whole story of how he ended up in jail. 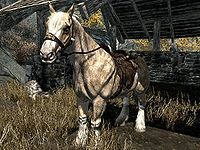 He also mentions that the horse he owes to Louis is not “actually” his; in fact, it's owned by the Black-Briar estate, namely Maven Black-Briar. However, Sibbi does not want to back out on the deal with Louis, so he offers you the second half of the payment owed if you steal Frost from Black-Briar Lodge. He also directs you to where the lineage papers are at the lodge. If you're feeling put upon, you can persuade Sibbi to give you the key to the lodge strongbox containing two-hundred fifty gold. To the right of the ladder in the basement is the lodge strongbox. The strongbox is master level but can be opened using Sibbi's stash key if you got it from him back at the jail. Around the corner, you will find Frost’s lineage papers on a table. Take the papers and leave the lodge. You can choose to tell Maven Black-Briar about the plot. However, this can result in a slight bug. 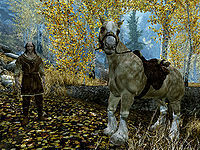 If you tell Maven and then deliver the horse to Louis, you may encounter a thug and Louis. The thug will kill Louis unless you intervene, and the survivor will attack you. Esta página foi modificada pela última vez à(s) 16h51min de 7 de dezembro de 2015.